In communities around the country, groups of senior ladies are making their way around to their communities most popular spots, dressed to the nines in bold red hats. These women lovingly refer to themselves as Red Hatters and they are part of a growing group known as the Red Hat Society. Nearly 100,000 women from all over the United States and 31 different countries around the world have already joined this organization and the numbers are already growing. Their motto is “you’re never too old to play dress-up” and their purpose is a simple one. These women dress up in red hats and go to museums, shows and restaurants together in groups. It is a social club that is all about fun and members can be found from all walks of life, including a growing group of women who live in assisted living facilities. However, this group is about more than just buying fun hats, it has actually proven to be a very valuable resource for many senior women today, especially those who are receiving at home care or who are dealing with feelings of loneliness and isolation. Depression and feelings of loneliness are becoming increasingly common in elderly women, and social groups such as the Red Hat Society help provide these women with the social interactions that the need to live safe, healthy, happy and balanced lives. 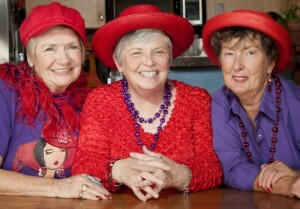 The goal of the Red Hat Society is to provide women over the age of 50 with the “Five F’s”: 1. Fun 2. Friendship 3. Freedom 4. Fulfillment 5. Fitness. The group not only has local chapters in cities all over the country, but specialty chapters in different nursing homes and assisted living facilities as well. With these groups, senior women who want the opportunity to get out of their assisted living facilities and explore the area around them can have a chance to experience new place and try new things, all while making great friends. For women who are struggling with loneliness or isolation or for those who feel a loss of independence, this group can be a great opportunity for them. There are many senior women who have also found that groups such as the Red Hat Society can help them feel more independent and help them easily transition to life in assisted living as they maintain an active social life outside of their senior living facility. While many will notice the parade of senior women in purple outfits and red hats visiting their local restaurants and attractions, this group is about so much more than dressing up. With the Red Hat Society, many women dealing with the challenges of senior life in today’s world can get the support they need from their peers and a little extra social time they may desire to feel like themselves as they transition to life in assisted living. For those who don’t have a local chapter in their assisted living facility or home town, the National Red Hat Society is always interested in helping women start new chapters all over the world.